In today’s world you need to be prepared for the uncertainties that life can throw at you. And today, more than ever you cannot afford to make any mistakes in your financial and wealth management planning. If you’re in a place where you’d like to get some help, but you don’t want to hire a full-time financial advisor, our Private Wealth Coaching™ program is for you. Our Private Wealth Coaching™ program is a personalized, two (2) meeting process which also includes an optional 60-minute follow up telephone discussion with Brad. With a professional analysis and advice personalized to your specific situation, our Private Wealth Coaching™ can help you pursue your financial goals. The best thing about our Private Wealth Coaching™ is that it’s personal: it’s about you! We take a detailed look at your unique goals and your current financial situation, and then help you take control of your financial situation. Document what your goals and objectives are in writing, so that you and your spouse can see them, adjust them and pursue them. Review all of your assets (including businesses and real estate) and talk with you about your current and future plans specific to each asset owned. Gather your documents and answer any questions about the scope of the review being completed on your behalf. Review and analyze your estate planning documents to determine and outline if your documents are consistent with your stated goals. 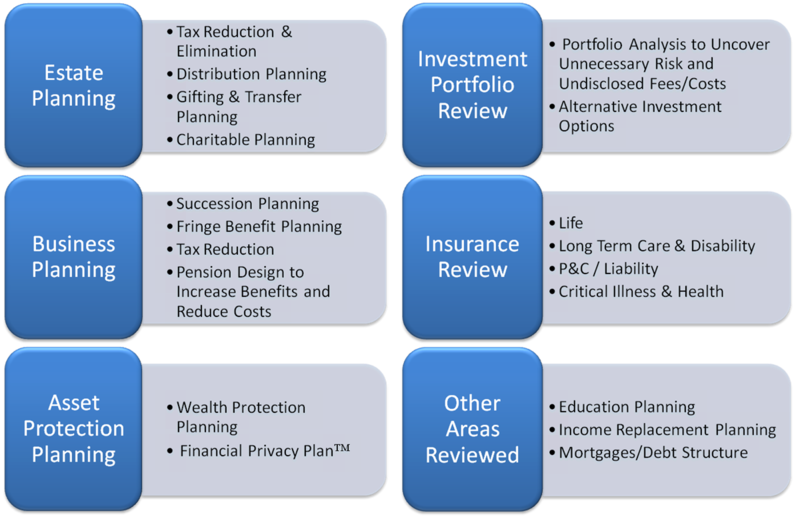 Review and analyze the tax reduction planning you have in place. This includes suggesting strategies to avoid unnecessary taxation and improve your accumulation planning. Review and analyze your current insurance coverages, including suggesting ways to improve coverage and/or reduce costs. Review and analyze your investment portfolio using Morningstar and other tools to uncover hidden risk and/or unnecessary investment fees. We then will provide some suggestions that might help improve your accumulation planning and/or net income received during retirement. Give you an easy-to-follow, short-term written action plan (such as a 30-day and/or 90-day action plan) that fits within your long-term goals. Our Private Wealth Coaching™ program and Wealth Mapping Report™ is a cost- effective way to create strategies, action plans and clear pathways for your “financial” future customized for you and your family. Sign up here for low-cost Private Wealth Coaching™. * The determination of whether or not you should pay a fee for our Private Wealth Coaching™ or if you want to take advantage of our complimentary Wealth Management SOS™ (“Second Opinion Service”) is on the “honor system” as the determination about who pays a fee for our service (or not) is left up to those who seek our assistance.